Jamie Edwards is a user researcher within the Customer Insight team at Intellectual Property Office (IPO). We have recently passed a ‘live’ service assessment for our new digital application service for registered designs. Whilst IPO already has a number of core transactional online services, the ‘Apply to register a design’ service is the latest digital service developed to meet user needs. 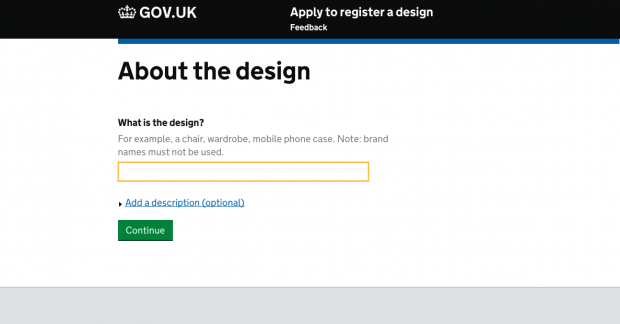 The ‘Apply to register a design’ service went to public beta in September 2015, replacing the previous paper application process. You can register the look of a product you’ve designed to stop people copying or stealing it. The look of your design includes the appearance, physical shape, configuration and decoration. Registering your design protects any aspect of it and gives you the right to prevent others from using it for up to 25 years. A wide variety of user research has been conducted on the service, before and after it went live. We’ve conducted focus groups, external testing with private applicants and attorneys, and conducted assisted digital and accessibility testing. Users valued the ability to apply to register a design online. Those who tested the service found it easy to use and navigate. However, one thing that was missing was the option to save a draft of their application so that they could return to complete it later. This has now been implemented within the live service. As we tested the service for accessibility, we discovered that some of the headings used on the ‘Apply to register a design’ pages were not as logically structured as they could have been. For example, inconsistent formats were used where an h1 heading was followed by an h4 heading. This caused some difficulty and confusion as users progressed through the site, and it was picked up by all screen reader testers regardless of the software type they were using. Sarah Combstock, a fellow user researcher at IPO, wrote a blog post discussing this accessibility testing in more detail on the IPO blog. What was previously a cumbersome and error prone paper-based process, is now a much more efficient, user-friendly system that our customers were quick to embrace – 69% of applications were filed using this service in March 2016 and this has grown rapidly to 98% in April 2017. Despite the increase in the volume of applications, we are examining and registering new designs more quickly than ever. This is because the avoidable customer errors have largely been eliminated. As a result of this, in October 2016 we were able to pass on our cost savings to our customers in the form of reduced application fees. We were therefore delighted when we passed our GDS live assessment on 26 April 2017. The panel was particularly impressed that all recommendations from the beta assessment had been adopted. They also noted the passion of the multidisciplinary team who will continue to iterate and improve the service in live, led by the designs service manager. GDS design and style guides have been followed throughout the service and the assessment panel described the ‘migration from a largely paper-based, error-prone process to an exemplary digital service’. The work doesn’t stop here. There is a backlog of work aimed at improving the service. The team have been looking into digital registration certificates. This would result in certificates being emailed to the applicant, replacing the current process of being issued by post. As designs are being examined and registered within 3 days, emailing design registration certificates would again increase the efficiency of the service we provide for our users. We will continue to iterate this service for our users so we would welcome your further feedback to help us with this service going forward. Follow IPO on Twitter, and don’t forget to sign up for email alerts. A great success, congratulations on passing the live assessment. Keep iterating! Hi thanks very much for your comment. I am the Designs Service Manager. Designs eCerts are coming soon, and we will be using gov.notify to deliver them. We tested the service in BETA, and are promoting through to live in the next month or so. We did have to make priority calls. Our designs service team are currently working on other higher priority items. We are proud of the improvements we are making for users of our Designs Service, but we have some way to go before it is an end to end digital experience.